The only one who can stop a serial killer is the one who inspired him. 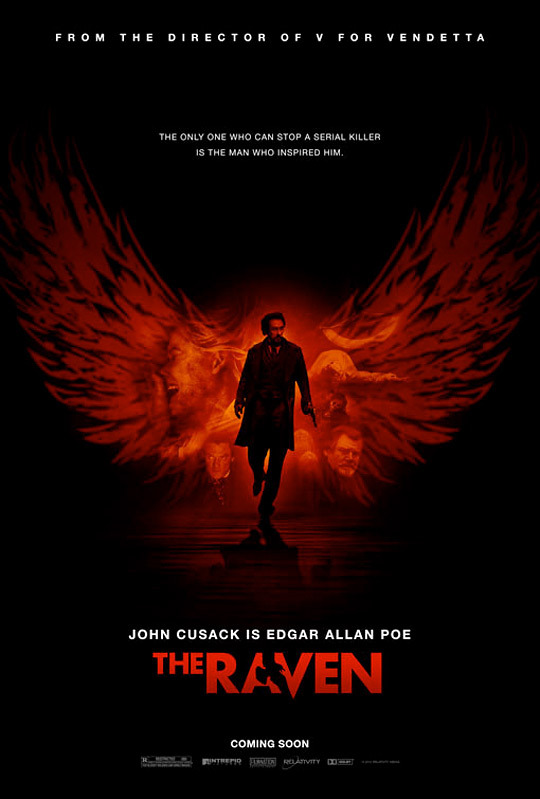 Relativity has officially unveiled a new poster on EW.com for James McTeigue's The Raven, starring John Cusack as the poet Edgar Allen Poe, who, as the tagline says, helps to solve a series of murders inspired by his own stories. The release of the film was also recently pushed from early March to late April 27th, which I have to say isn't a good sign, but I'm still curious to see this. The poster features a bold red-winged design, which is quite appealing, but I don't like the other faces blended into the background. View the latest trailer here and see the poster below. The Raven is inspired by the famous Edgar Allen Poe poem. McTeigue explained to us years ago that it's "an amalgamation of Poe's stories crossed with Se7en. It's about a serial killer loose in 1849 Baltimore." As for the actual plot, he stated that "at each murder that he does, the killer leaves a clue, and basically Poe is set against the clock to find someone before they die." The screenplay was co-written by Ben Livingston and Hannah Shakespeare. Relativity & Rogue Pictures will be distributing the movie and have recently updated the release date to April 27th later this spring, which means it's getting dumped right before the summer. Me too X! Cusack is the most underrated actor of our time! !I can't wait to see this movie! Why is this being made again? Not very original, still pretty effective.